It takes eight in a male synchronised swimming team to perform the wilting flower. 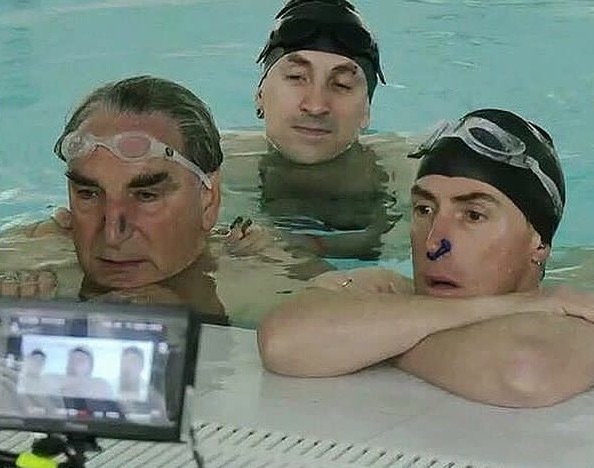 The cast of new British comedy ‘Swimming With Men’ is an incredible line up of British talent. Directed by BAFTA nominee Oliver Parker, the all male synchronised swimming team is made up of comedy genius Rob Brydon, BAFTA winner Adeel Akhtar, Downton Abbey’s Jim Carter, Sherlock’s Rupert Graves, Daniel Mays who has starred in Atonement and Line Of Duty, and This Is England’s break out star Thomas Turgoose. But even with six such incredible actors you can’t perform the right moves without two extra teammates, so who are the ‘actors’ seven and eight you didn’t recognise in the film? 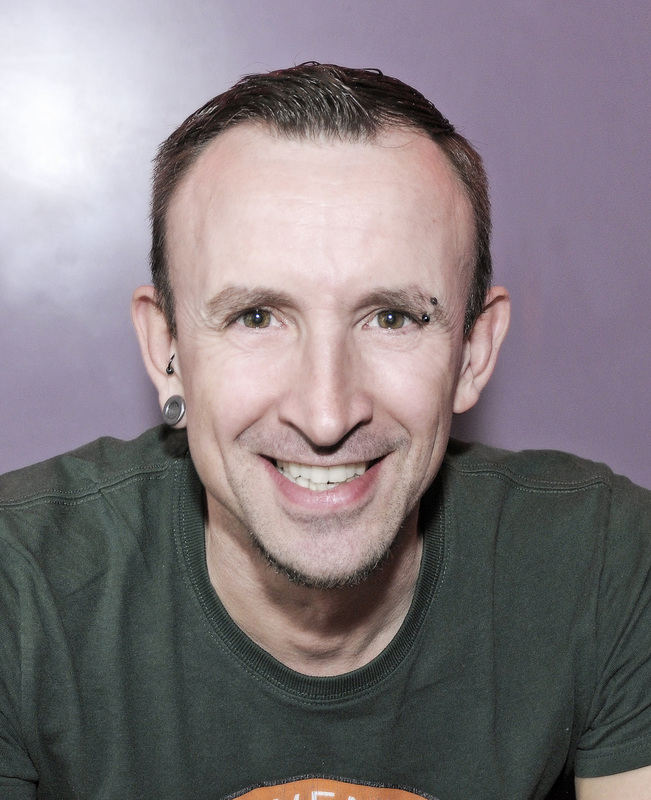 Introducing Chris Jepson – aka Silent Bob and Ronan Daly as The New Guy, who quite literally held the team together! Both Chris and Ronan are real life middle aged, male synchronised swimmers that live and swim in London. 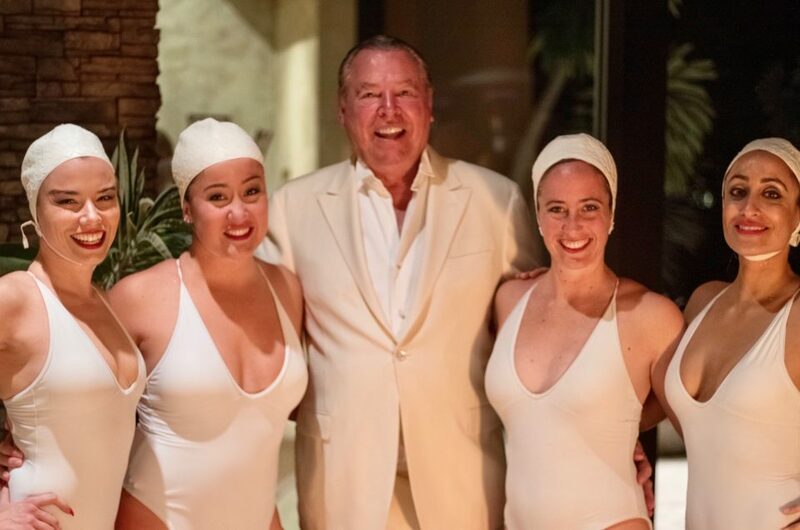 When put forward by Aquabatix for the supporting roles in the team, no one really anticipated what an integral part of the film they would become and how their relationships with the all-star cast would develop. Photographer Chris Jepson, 50, grew up in Cornwall by the sea so water safety was really important. “All my family were members of the local swimming club, Newquay Cormorants. In fact my mum ran the club for more than 40 years! My sister was a keen competitive swimmer and did synchro and at 13 a friend and myself had a go, decided we liked it and went every Sunday. We did the usual figures and sculls training and eventually put together a duet to the Jaws soundtrack. We performed at local events, holiday parks and hotels for tourists during the summer season and even at the Western Counties Championships. Reactions were always positive and supportive but as we were the only boys doing it there was really nowhere to go or advance to so when I left home for Uni at 18 it fell by the wayside. A few years later I discovered Out To Swim had a masters synchro squad in London so I went along for a try out, loved it and stayed! 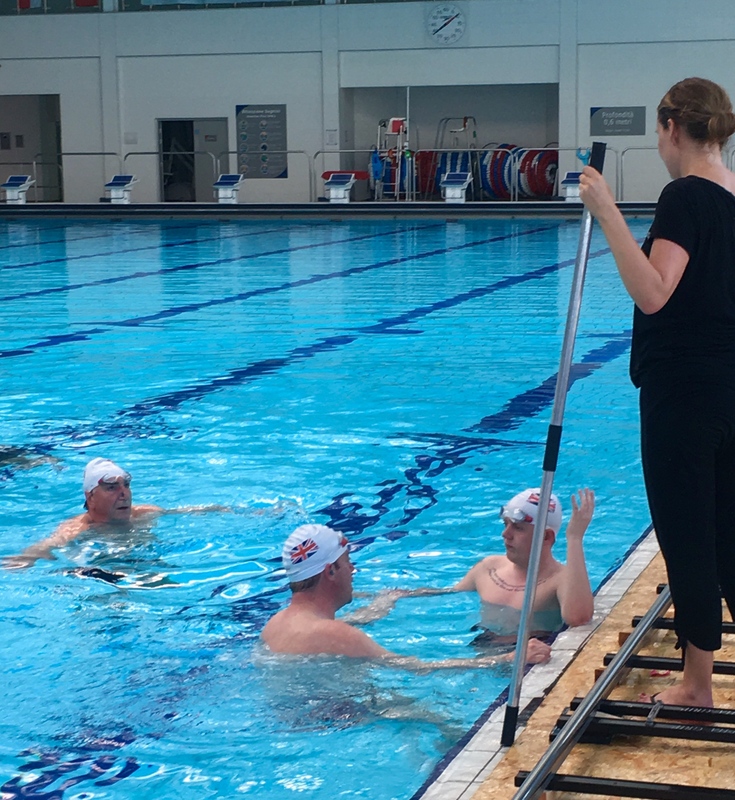 Swimming with OTS as an adult is great, it’s a friendly, supportive, mixed group and because we pay a subscription to be there we all work hard to get the most out of it. In the past six years I have competed nationally and internationally in Paris, Copenhagen, Munich and more, and have medals of all colours! When the opportunity to be in Swimming With Men came up I jumped at the chance. I thought it would just be a casual SA (supporting artist) role but as an integral member of the eight-man team I was at the heart of every rehearsal and most scenes over the six week shoot. All the cast and crew were amazingly supportive and welcoming to this newbie to their world and treated me like one of the family. The film itself is a light-hearted, feel-good story about relationships between middle-aged men who bond in the water and out. I think it portrays synchro as a fun activity but also one that is good exercise and accessible for everyone. No expensive special equipment is needed, apart from a nose clip, and it is open to almost any ability level so hopefully more boys will see the film and give it a go. 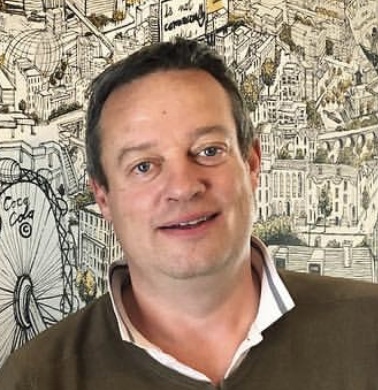 Property manager and part time helper at the Kennington Coffee Shop Ronan Daly, 50, joined the UK’s only male synchronised swimming team, Out to Swim Angels, ten years ago. In 2010, they won gold at the Gay Games, a prestigious competition for LGBT athletes. “I only got into synchronised swimming after trying to call my partner Charles’s bluff. When we met, he said ‘let’s do something fun as a couple. Why don’t we go swimming?’ I wanted to socialize more, so I told him I would join the synchronised swimming team if they would let me in, knowing full well they wouldn’t because I’m a man. To my complete surprise there was an all-male team and here we are! Ronan found his role to be supporting in more ways than one. 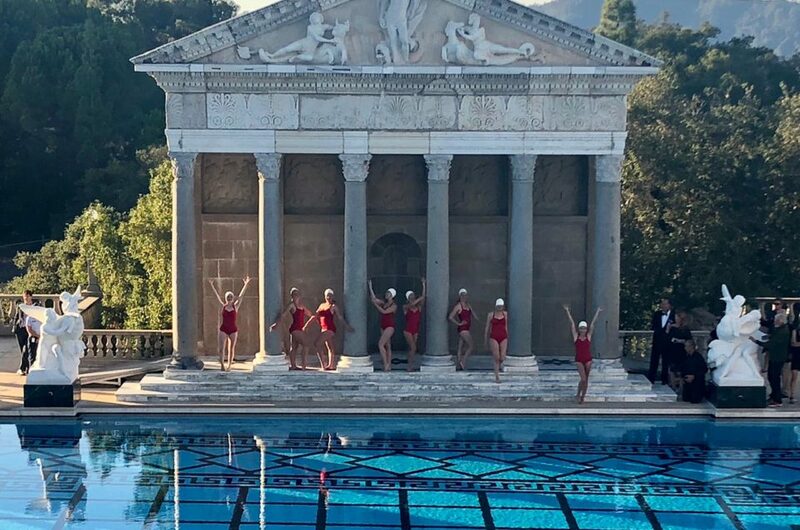 “As a synchro swimmer, my job was to help make the actors look as good as possible, so helping to keep them up and achieving the patterns in the water. A base to shine off. One of the best experiences was watching the actors develop into a synchro team. They even began thinking like a synchro team. Though my favourite moment was the night shoot. Everyone was really rallying eachother up to keep going and I just loved jumping onto an inflatable pink giraffe. It was all rather surreal. I have my normal life but also now this film has come into it which has turned it upside down. I’ve never hankered after stardom but now I am being asked to appear on chat shows in my native Ireland and giving interviews to national press. My 15 minutes of fame finally! This all male synchronised swimming team movie will be making a splash in UK cinemas on July 6th.